What’s that whistling sound on Campus Wannsee? Have you noticed that strange whistling sound on Hahn-Meitner Campus at Wannsee? 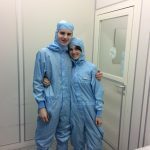 When I told the PhD students of the research group for inorganic and solid state chemistry at the Technische Universität Berlin that I will be part of the Summer Students Programme at the Helmholtz-Zentrum Berlin, one of them had something interesting to tell me. He advised me to pay attention to a whistling sound on Campus Wannsee and he also revealed to me where to find the source of the sound. So on my fourth day at Wannsee I decided to find that thing that made me listen attentively to its music. 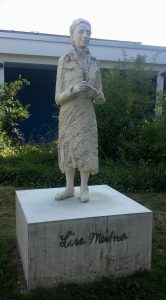 A statue of Lise Meitner in the little garden behind building “C”. Lise Meitner was an Austrian physicist who, together with Otto Hahn, worked on radioactivity and discovered several radioactive nuclides. Besides that, she, together with Otto Frisch, provided a theoretical explanation for Hahns experiments on nuclear fission. Unfortunately, the 1944 Nobel prize in chemistry for nuclear fission was awarded solely to Hahn, even though Hahn himself was of the opinion that she well deserved the prize. At lunch break I got out of the office, passed by Lise Meitner in the little backyard and left building “C”. Having the directions in mind the PhD student gave me I walked my way. Following the whistle that is like a sound a bird makes when it sings I turned left and kept on wandering. At some point I was not sure if I was taking the right path but the noise becoming clearer meant that I was just getting closer. On my journey to the origin of the sound I passed by the chemicals and waste disposal and it did not last long I came to a dead end. Or not? Trees and bushes were the only objects in front of me. But inbetween, there was a little sandy path. So I decided to look behind the trees. There I found a little green field. And there, the source of the sound seemed to be there, too. That thing that makes the noise that reminds one of a squeaking swing. That thing looks like three giant bells. One after another these bells emit a high tone. I stood there pretty surprised and took several pictures of it. 30 minutes passed and my lunch break was over. I decided to turn back to the office. Now wondering what these bells are made for I asked a few people. Some did not know what they are for, some say it has something to do with radar and others say it is just art. “When you enter Campus Wannsee keep walking straight on and you will find the source of the sound.”. The whistling three giant bells. Will you find them on Campus Wannsee? And maybe you will find out what these bells are really for? after more than 2 weeks of puzzling about the meaning of the bells I think it is now up to me to give you the answer. The 3 bells are parts of a so called “SODAR” (SOnic Detection And Ranging) to measure the wind profile (speed, direction, turbulence) up to a height of 510 m. It belongs to the radiation protection systems at the LMC to calculate the effects of the nuclear facilities at the Campus on the environment. For more information you will find a description in Wikipedia ( https://en.wikipedia.org/wiki/SODAR) or come to ask me or my colleagues at the radiation protection department in building C (upper floor). Thank you for clarification! I wondered as well about these “bells”. Great story, Fatma! I have no doubt that at least someone on campus went searching for those bells after reading your post! A great story Fatma. Will definitely look for the mystery bells, and I might have someone to ask about them. Thank you for a great post. Thank you for this nice post. Strange objects are found on our campus, this is true. But they do have a function, in general. 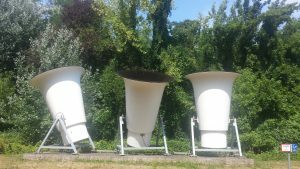 Somebody told me that these “bells” serve to measure the clouds above the research center, but I am unsure whether this is true. I will now try to find it out, you made me curious. I really liked the way you tell the story, Fatma. Congratulations on your post. You got me really thinking about those bells. Your story is very engaging that it will be my first priority to find these bells and figure out what is their story on my next visit to Wannsee. But just a guess, they may be related to the war as everything strange here revealed to be.